The PCIeDIOTB module is a DIN-Rail Mount Terminal Block Interface Module for the usage in conjunction with the PCI Express add-in I/O card PCIeDIO and makes for easy user's sensors and actuators cabling. It can be mounted on conventional NS 35 or NS 32 DIN rails. The module connects to the 37-pin DSUB female socket of the PCIeDIO card via its 37-pin DSUB male connector. The pin assignment is organized for the use of a 1:1 connecting cable. Not only for electrically noisy environments, shielded connecting cables are highly recommended. 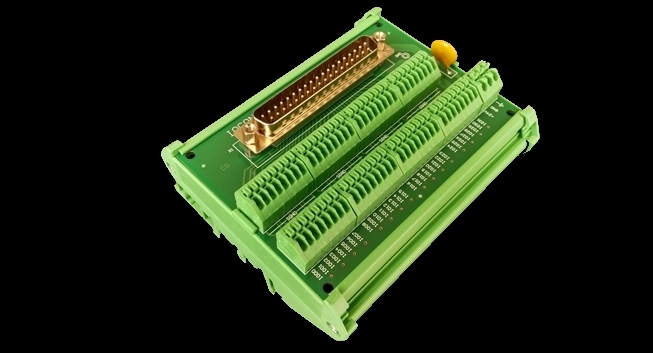 The terminal blocks of the module allow access to every pin on the DSUB connector and therefore likewise to every I/O and to the +24V/GND of the PCIeDIO board. To support flexible connectivity of the users' sensors and actuators to the module, further terminals with GND reference potential are available. The terminal blocks provide push-in spring connection technology with easy actuation.